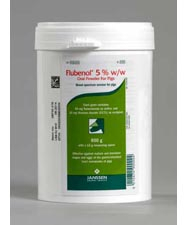 Flubenol Pig Wormer 600g Flubendazole Treatment pack is a broad-spectrum anthelmintic for oral administration, active against mature and immature stages of the following nematodes of the gastro-intestinal tract of the pig: large roundworm, red stomach worm, nodular worm, whipworm. White powder containing flubendazole 5 % w/w (50 mg/g) in a 600 g tub. Flubendazole is a broad spectrum anthelmintic for oral administration, effective against mature and immature stages of the following nematodes of the gastro–intestinal tract of the pig: Ascaris suum (large roundworm) including migrating larvae, Hyostrongylus rubidus (red stomach worm), Oesophagostomum dentatum (nodular worm) and Trichuris suis (whipworm) and Strongyloides ransomi (threadworm - adult). Flubendazole is ovicidal. If animals are to be treated collectively rather than individually, they should be grouped according to their bodyweight and dosed accordingly, in order to avoid under- or overdosing. 1. Individual treatment (Single administration): Add 1 g of Flubenol for each 10 kg bodyweight onto the finished feed, as a single animal dose. (This is equivalent to 5 mg of flubendazole per one kg bodyweight). One 13 g measuring spoon treats one 130 kg sow. 2. Treatment frequency: Twice a year unless recommended otherwise by a veterinary surgeon. Pigs brought onto the premises should be treated on arrival and before mixing with other animals. Regular faecal examination is advocated to know which worms are present on the farm so that specific measures may be taken to prevent re-infection. Nodular worm: every 2 months. Large roundworm: every 2 months. Red stomach worm: every month. Accidental ingestion by humans should be avoided. May cause sensitisation by skin contact. May cause skin and eye irritation. Wear overalls, safety glasses and impervious gloves when mixing and handling the product. Wash affected parts if skin contact occurs. If accidental eye contact occurs, immediately rinse thoroughly with water. If the operation involves potential exposure to dust, wear either a disposable filter on a half mask respirator (conforming to European Standard EN149) or a non-disposable respirator (to European Standard EN140) fitted with a filter (EN143. Pigs must not be slaughtered for human consumption during treatment. Pigs may be slaughtered for human consumption only after 7 days from the last treatment. Store in tightly closed original containers. Do not store above 25 °C. Prepare immediately before use; discard any unused feed at the end of the day. 600 g plastic tub with a 13 g measuring spoon. Flubendazole is a synthetic anthelmintic belonging to the benzimidazole carbamates. Below are some recent questions we've received regarding Janssen Flubenol Individual Treatment Pack, including answers from our team. Can you supply fluvenol 5 to Australia? can you supply this to Australia? Please quote. Flubendazole is an approved drug in Australia so we can export it. Delivery is £10 for a package up to 2kg in weight (easily enough for 1 tub).